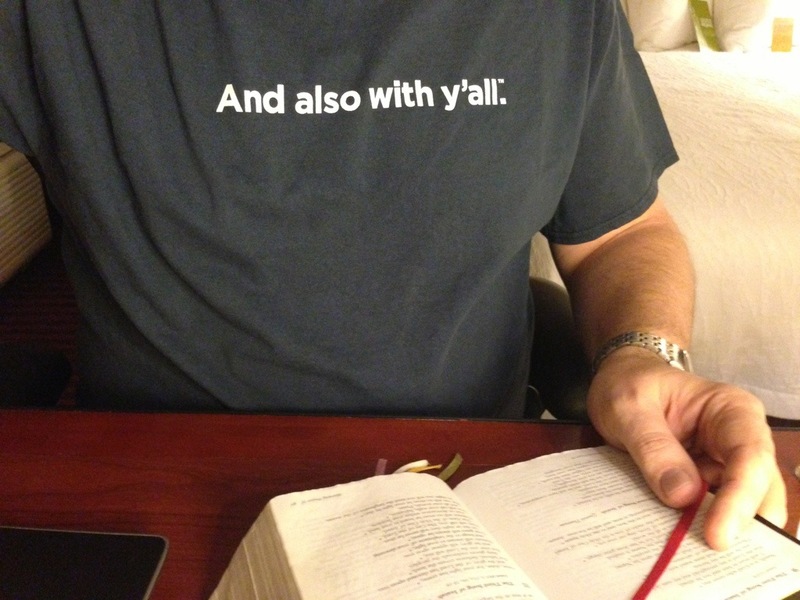 Since I’m in Tupelo, MS this morning it seems only right that I should wear my Altar Press t-shirt for Morning Prayer. and his glory will appear upon y’all. Whatever language you speak in, whatever nation you belong to, wherever your life has led you to, the Lord will rise over you. If we’re true to our calling as members of Christ’s body, if we love one another as Christ has loved us and love our neighbors as ourselves, then we will reflect the “light to enlighten the nations” himself. This entry was posted in Daily Office and tagged Canticle 11, Morning Prayer on April 30, 2013 by Rodger Patience. Whatever your task, put yourselves into it, as done for the Lord and not for your masters, since you know that from the Lord you will receive the inheritance as your reward; you serve the Lord Christ (Colossians 3:23-24). In a blog post from about a year ago, Rachel Held Evans, author of A Year of Biblical Womanhood, began a conversation on the Greco-Roman “household codes” reflected (and redirected) in several New Testament letters as well as in the passage from Colossians we read this morning. One of the very interesting tensions in the Christian life is trying to decide what kind of a household we actually belong to. We are “a chosen people, a royal priesthood” (1 Peter 2:9), and we are “no longer Jew or Greek … slave or free … male and female” (Galatians 3:28), and we are married (or not), and we are a church family, and we are a historical preservation society, and we are a company of friends, and we are a food pantry, and we are a monastic community, and we are a 501 (c) (3) corporation, and we are summer camp. Whatever we are, though, there’s a fairly constant thread in the Christian tradition. Our apparently ordinary lives are shot through with new meaning. We may seem like an ordinary family, or we may seem like a bunch of crackpots, or somewhere in between, but we are really living as members of Christ’s household. It starts at baptism: “We receive you into the household of God. Confess the faith of Christ crucified, proclaim his resurrection, and share with us in his eternal priesthood” (BCP 308). In the letter to the Colossians, Paul is urging his readers to live in the light of that belonging. Whatever your task — the same work you had yesterday, and perhaps the same work you will have tomorrow — put yourself into it as done for the Lord and not for your masters, wives, brothers, volunteers, board, counselors, managers, sisters, bosses. You serve the Lord Christ. 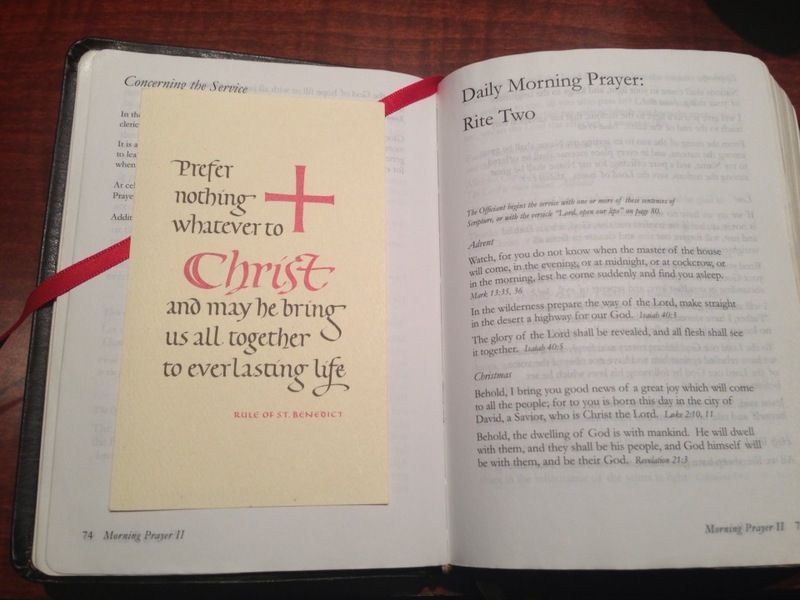 This entry was posted in Daily Office and tagged Colossians, Morning Prayer on April 29, 2013 by Rodger Patience. We are staying the weekend with friends in Lake Geneva, WI. As is our custom, John and I will get up early for the first Mass at his parish, St. Benedict Catholic Church in Fontana. I wrote about Benedict and his influence on our Anglican pattern of prayer a few days ago. Obviously, we’re hardly the only ones so influenced by his vision of a simple Rule of life — “nothing harsh, nothing burdensome” — which will help us, by ordering and organizing our prayer, study, and work, to cherish Christ above all and to cherish those around us, for whom Christ came into the world. This entry was posted in Daily Office and tagged Morning Prayer, St. Benedict on April 14, 2013 by Rodger Patience. See what love the Father has given us, that we should be called children of God; and that is what we are. The reason the world does not know us is that it did not know him. Beloved, we are God’s children now; what we will be has not yet been revealed. What we do know is this: when he is revealed, we will be like him, for we will see him as he is. And all who have this hope in him purify themselves, just as he is pure …. This is how we know what love is: Jesus Christ laid down his life for us. And we ought to lay down our lives for our brothers and sisters. If anyone has material possessions and sees a brother or sister in need but has no pity on them, how can the love of God be in that person? Dear children, let us not love with words or speech but with actions and in truth. I taught sexual misconduct prevention in the Dioceses of Chicago and Milwaukee from the beginning of the Church Insurance Company’s mandates about 20 years ago. This passage from the First Letter of John formed part of the prayer I used to open training sessions for more than a dozen years. The first year of training was really tough and stressful — the sexual abuse of children is a subject no one wants to talk about, but clergy and vestry and lay leaders were required to attend training, and (frankly) the training was pretty awful. It was heavy on statistics and risk and insurance riders and mandated reporting and penalties. Every time I taught, the tension in the room was so palpable that I ended up with a crippling headache. Sometime in that first year of trainings, though, I came across the new Rule of the Society of St. John the Evangelist, an Episcopal monastic order in Cambridge, MA. It was (at the time) a fresh, new rewriting of the Society’s original Rule. As I read it more deeply, I came to understand that the SSJE Rule is really an extended meditation on right relationship. “Beloved, we are now God’s children.” As God’s children, how should we live with one another? Gracious God, you see your children growing up in an unsteady and confusing world: Give us calm strength and patient wisdom as we bring them up, that we may guard them from harm, and teach them to love whatever is just, and true, and good; following the example of our Lord and Savior Jesus Christ. Amen. This entry was posted in Daily Office and tagged 1 John, abuse prevention, Church Insurance Company, right relationship, Rule, SSJE on April 12, 2013 by Rodger Patience. A member of my parish offers reflections on his Healing Journey Daily Blog on Facebook, and I appreciate his post yesterday from Oswald Chambers reflecting on Paul’s insight into Christ and his determination to “know nothing among you except Christ, and him crucified” (1 Cor 2:2). Chambers says, “The lasting characteristic of a spiritual man is the ability to understand correctly the meaning of the Lord Jesus Christ in his life, and the ability to explain the purposes of God to others. The overruling passion of his life is Jesus Christ. Whenever you see this quality in a person, you get the feeling that he is truly a man after God’s own heart” (My Utmost for His Highest). One of the lenses that helps me find insight into Christ is the Prayer Book pattern of orderly prayer — especially the Daily Offices — which was inspired in large part by the monastic pattern established by Benedict in the sixth century. 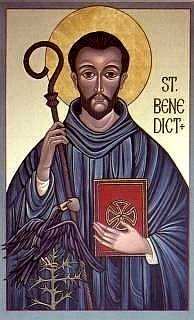 “Prefer nothing whatever to Christ,” says Benedict, “and may he lead us all together into everlasting life” (Rule 72). The Rule, the pattern of prayer, study, and work that Benedict established for his monks, was intended to free them from distractions and enable them to focus on worshiping God. In a similar way, the Prayer Book pattern of Daily Offices and weekly Eucharist is intended to shape our lives and help us maintain our focus on the face of Christ in the face of a very distracting world. It doesn’t matter whether you use the Prayer Book itself or the online offices from Forward Movement or Mission St. Clare or some other daily devotional; all of them promote the same rhythmic, steady, daily approach to prayer. 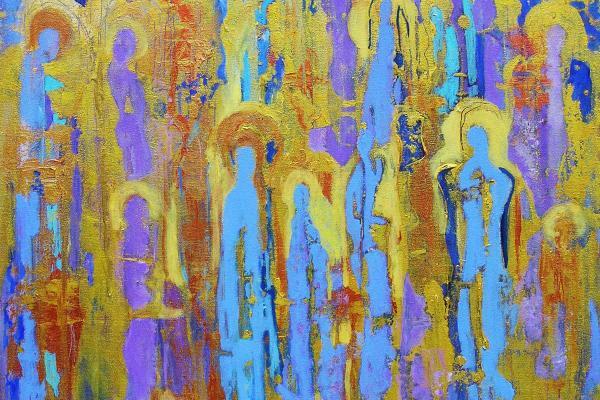 If our guides are doing their work — Chambers or Benedict or the Prayer Book or any other guide — they help us understand how Christ is present in our lives right now, and they encourage us to share that insight with others. 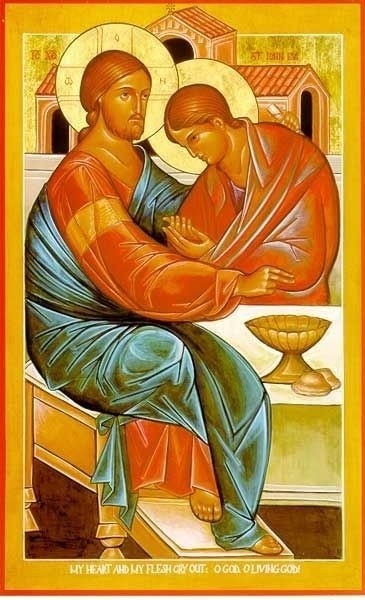 May we prefer nothing whatever to Christ, and may he lead us all into everlasting life. Amen. This entry was posted in Book of Common Prayer, Daily Office and tagged Benedict, Forward Movement, Mission St. Clare, Morning Prayer, Oswald Chambers, Prayer Book pattern on April 9, 2013 by Rodger Patience. After an early alarm and the drive to Norfolk International Airport, I was able to catch a breath in the Starbuck’s before going through security. This was part of the background music to Morning Prayer today. Vince Guaraldi is a favorite of mine, and this song, “Cast Your Fate to the Wind,” dovetailed nicely with the reading from Acts. “Now when they saw the boldness of Peter and John and realized they were uneducated and ordinary men, they were amazed and recognized them as companions of Jesus” (Acts 4:13). It’s the boldness of their act, healing a man in the name of Jesus, that makes them recognizable. They recount to their friends what has happened, not just the healing but their testimony before the chief priests and the elders, and “when they had prayed, the place in which they gathered together was shaken; and they were all filled with the Holy Spirit and spoke the word of God with boldness” (Acts 4:31). The apostles and their friends cast their fate to the wind — that is, to the mighty Spirit of God that hovered over the waters of creation and was now blowing through their lives — and that Holy Spirit not only inspired them to boldness but also made them recognizable friends of Jesus. Why not cast your fate to the wind, to the Spirit of God, today? What bold act will make you a recognizable friend of Jesus? This entry was posted in Daily Office and tagged Acts, Holy Spirit, Morning Prayer, Vince Guaraldi on April 6, 2013 by Rodger Patience.